The SEED Destiny series is finally over and I've decided to make a set of walls for my four all-time favorite episodes in the series. This is the third one and took approximately five hours to make! Most of that time was spent cropping out the image of Freedom and Impulse fighting for the backdrop. As for the source pictures, the background is a scan from an old art book of mine. All the other pics are from right here in Minitokyo! Full credits and thanks will follow in the post below so please read it! This wall was the second most difficult of the four to make and required quite a bit of dedication to finish. Hope you like it! Comments welcome. 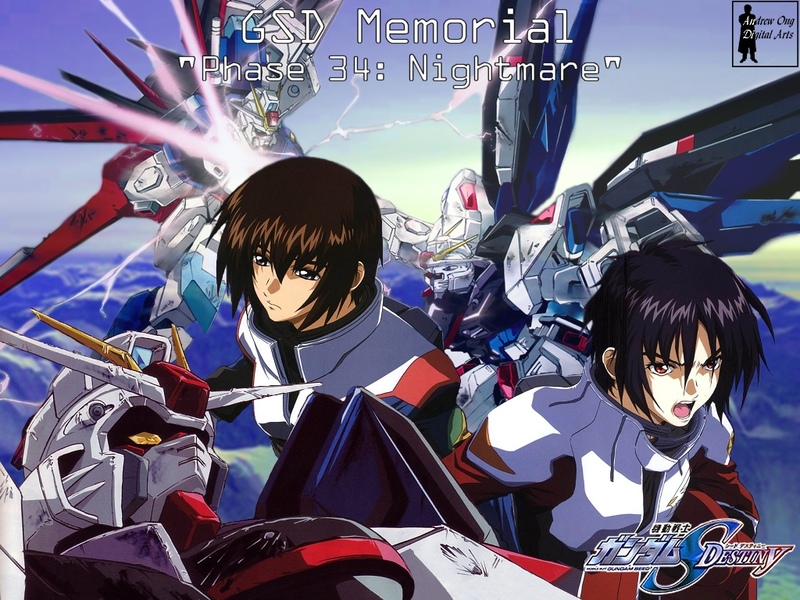 "Phase 34: Nightmare" is a direct result of my earlier favorite episode (Phase 32) and finally gives us the greatly anticipated showdown between Shinn Asuka and Kira Yamato. The episode begins with Chairman Dullindal declaring war on LOGOS, the invisible merchants of hate and dissension in the world. Shortly after the Minerva and her crew are drafted for Operation Angel Down: the destruction of Archangel as it moves towards ORB. Freedom and Archangel hold their own against the attacking ZAFT forces until the arrival of Minerva and Impulse. Talia offers Murrue and the Archangel crew a chance to surrender but Murrue politely declines, forcing Minerva to open fire on Archangel with its Tannhauser cannon just as Archangel reaches its escape point on the shoreline. Archangel narrowly escapes but Freedom is not so lucky. Despite Freedom's technical superiority, Kira finds himself no match for the determined and vengeful Shinn. After running numerous combat simulations using data gathered from previous ZAFT engagements with Freedom, Shinn has successfully devised a strategy for defeating the legendary mobile suit. Fully utilizing Impulse's Silhouette interchangeable weapons systems, Shinn cripples and corners Freedom before delivering the fatal blow; driving Sword Impulse's massive beam sword through Freedom's shield and torso. After a devastating explosion, only a badly damaged Impulse remains. Inside the cockpit, Shinn laughs as tears stream down his face. "I did it... Stellar, I finally did it..."
Shinn was truly at his height in the series in this episode, displaying extraordinary skill and tactics (not to mention that wonderfully manic look on his face at the end). Sadly from here it was all downhill for him. And while it saddened me to see Freedom go, I knew that it was necessary for Kira to eventually obtain his new Strike Freedom. So for all this and more, this is definitely not an episode to be missed in this series. I'd like to thank angel14 for the scan of the wrecked Freedom and bikixnn for the awesome scan of Kira and Shinn in their pilot suits. And special thanks to nat (ningen nattoli) as well for the image of Freedom fighting Impulse, which I took from her incredible 'Clash of the Titans' wall. Links to the related scans are below. Well, that's it for now. Thank you for reading this and look forward to the last piece of my memorial series! Until then! I've never seen those images before. They're super! I love this! Really crisp quality too! Again, I love this! That was one of the best episode in the series. Although as a Kira fan, I hate to see Kira defeated but Shinn did a great job. He done his homework. At least Kira returned with a more powerful, upgraded suit. Ur wallpaper depicted the storyline well for this ep. it's a great wallaper of kira and shinn! thanks a lot for it! The face of horrible shin eh Wild only in the data between Kira Mat Our original cast.